No, I had no idea what that meant either. Other than that a lot of big stores are holding one-day sales to encourage consumers to get started on their Christmas shopping. As with many fads being adopted here in the UK, such as Hallowe'en, Black Friday originates from America. Some believe it was the day when shops finally made it into the black. But it's a big day in the US as retailers lure in shoppers after the Thanksgiving celebrations. The UK is now getting in on the act with many stores offering huge discounts to kick start the pre-Christmas spending spree. But I'm trying to hold on to my principles and instead of being tempted by the huge offers around today, I'm keeping my purse closed tight, until tomorrow when I'll be embracing the UK's first Small Business Saturday. Small Business Saturday, held on one of the busiest shopping days of the year, aims to encourage people to support local, independent, small businesses across the UK and celebrate the contribution they make to our economy and local communities. I'm really trying to shop as locally as possible this Christmas. Not always an easy task when the 6 year old and 3 year old are so attached to the Argos catalogue. But at least I know that most of the toys they have their eye on are also stocked in a local, independent toy shop. I have started well and managed to score a couple of gifts at a local craft fair last Saturday. I am lucky to live in a town where we have a fairly wide range of independent traders, although Costa has recently, and slightly controversially, set up shop. 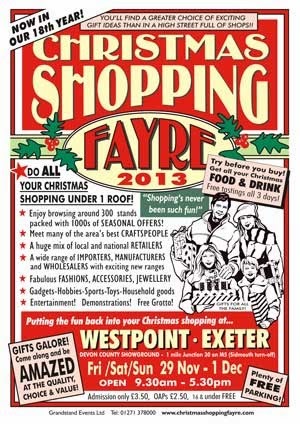 So tomorrow, I will start the day with a shopping date with my mum at Exeter's Westpoint Arena for the Exeter Christmas Shopping Fayre. 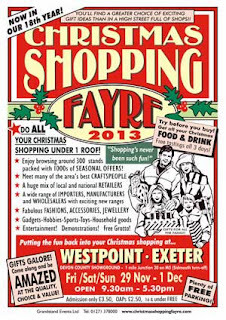 I then plan to head back into Teignmouth to visit some of the town's lovely gift shops, such as Turn of the Tide, Gallery 8, Poppadums Healthfoods, Shabby Chic Lane, and The Fountain For Health. There is also a wide range of charity shops where I love to buy stocking filler books and toys for the children. Of course, one of the biggest issues about Christmas shopping when you have small people in tow, is that it can be very difficult to buy what you see when they are with you. So I have no doubt I will resort to some online forays with the more established retailers at some point. After all, some offers are just to juicy for my thrifty self to resist. But, oh, I will so try to be good this year and buy as locally as I can. How will you support Small Business Saturday?